In 2017, the Global NCAP and the Automobile Association of South Africa launched the #SaferCarsforAfrica campaign. 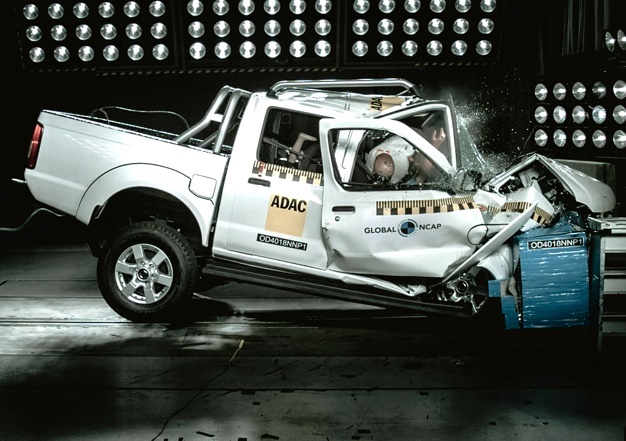 Earlier in November, the two organisations launched the second part of their project.The campaign coincides with the first independent crash tests of some of South Africa’s most popular compact cars.For the second round of tests, the Nissan NP300 bakkie was one of four vehicles crash tested. 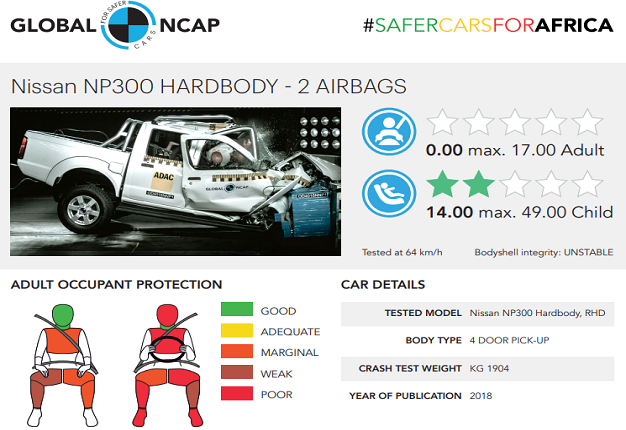 The NP300 'Hardbody' achieved a zero-star rating for its poor adult occupant protection mainly in the driver head and chest areas in the frontal crash test at 64km/h. Despite its zero-rating, South Africans don't really seem to mind as much. The Nissan NP300/Hardbody make the top 5 rankings for best-selling bakkies every month. During October, NAAMSA reported a sales figure of 821 units leaving showroom floors. The vehicle structure collapsed during the crash test and it was rated as unstable. The steering wheel column did not collapse penetrating the passengers' compartment, creating an additional risk for the driver as it moved straight into the dummy chest. This performance showed a significant risk of injuries for the driver despite the car being equipped with double frontal airbags. The high probability of life threatening injuries to the driver’s head and chest resulted in the zero star adult occupant protection rating. Even with an airbag the driver’s head and chest showed high biomechanical readings. The NP300 'Hardbody' achieved two stars for child occupant protection, the low result is mainly explained by the decision of the car manufacturer to install one of the Child seats without following Child seat manufacturer clear instructions.Nissan South Africa says: "The safety of our customers is Nissan’s top priority. All of our cars meet or exceed regulations in all countries in which they are sold. "The Nissan NP300 is a tried and trusted partner for businesses and entrepreneurs, providing reliability and affordability. "Continuous improvements are being made to the NP300 such as dual airbags and ABS brakes which are fitted as standard equipment. Nissan is studying further enhancements."